I realize that the amount of updating I do on my little wine blog is “constant” and “at a neck breaking speed” and that many of you can’t possibly keep up with all the “award winning” content that flies out of my brain and onto my keyboard and then into your internet reading device. I strive to be the best “professional wine blogger” that you know. You may have remembered my love of German pinot noir (I sure do like it) from a few years ago. In Germany, pinot noir is known as “spatburgunder” - I’m assuming that “burgunder” has something to do with the grapes spiritual home of Burgundy. So, this wine is made from pinot noir, which of course is a black grape. If you make a white wine from a black grape (great example is champagne) the french would call it “blanc de noir” which of course means “white from black”. Already, the wine is dorky. You don’t often see non-sparkling pinot noir made as a white wine. Spatlese. The Germans have a pretty cool system of rating how ripe the grapes are when they are picked. The riper the grape means there is more sugar which can increase the alcohol, but also any actual sweetness as well as the body of the wine. 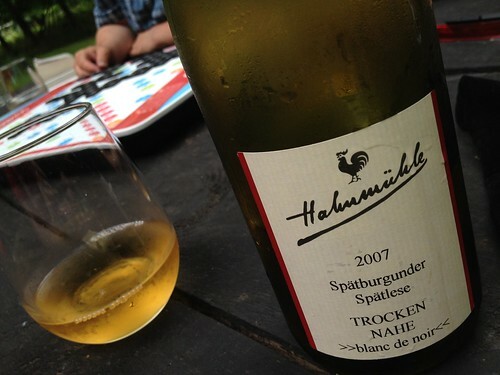 I’m used to seeing spatlese used on a label buying riesling indicating that I’m buying a wine that is a bit off-dry and could have a tad residual sugar. I’m not used to seeing it on bottles of pinot noir.